With consolidation of the current environment clearly very much on the minds of senior leaders in the service providers (e.g. Capgemini and iGATE widely mooted to be close to tying the knot), it's pretty clear that we're distracting ourselves from entering the As-a-Service world anywhere as quickly as we should be. There are simply too many operations and IT careers tied to legacy ERP and business processes, and too many providers making too much money feeding off this legacy, for the change to happen at anything bar a snail's pace. There simply is no burning platform for change - no Millennium Bug, no Dot.com bust, no Great Recession in the offing (perish the thought...). It is my belief that we're at the start of a ten-year cycle of interim change as operational human labor is gradually replaced by automated platforms that are in turn augmented by analytical and creative talent and cognitive computing. The smart service providers are those which are going to address this ten-year phase of transition head-on and not get distracted by maximizing their position in the old model. While IBM is making many right moves investing for the long-term, it's this long drawn out medium-term period that's the real problem. Watson, Apple and Twitter alliances, its new $3bn IoT unit, Softlayer etc. all create As-a-Service mojo, but it's going to take years to get to the revenue levels that can replace the traditional services dollars that are in gradual decline. It's simple - make a move on the largest, most aggressive and dynamic of the Indian-heritage providers: TCS. Together, they would crush the market across all aspects of delivery, all verticals, all technologies because their individual forays in the As-a-Service world could play off each other and get scale even quicker. They would have skill at massive scale and could undercut the competition on key deals - almost at will - if they needed to. Together, they would have the footprint for global delivery, transformational talent, low-cost transactional labor, proprietary automation and cognitive capability, analytics, BPO, cloud platforms, mobility, digital consultants, unique software solutions and product engineering... the list is endless. An acquisition would also give the incentives to restructure the existing labor base of both providers through a very active program of automation. Let's face facts, we're in a worrying downward spiral in the services business as enterprises and service providers face unprecedented challenges on this inexorable journey to replace operational and IT labor with products. Rather than price-compete each other out of business, the service providers need to figure out how to blend the best parts of each other - especially from the As-a-Service world - to get ahead of the change and the pain, and there is nothing like mega-mergers to mask the change that is needed for a few quarters to keep the Wall St investors at bay. Providers need to buy some time and some air-cover to get this right, and what better than complex mergers? Now would IBM really buy TCS? Probably never, as there is simply too much history in both providers, and this is just too bloody big. Plus, it would create a leadership challenge of unprecedented proportions in this industry. But this industry needs change, it needs real disruption like this to shake us to our foundations and force the new thinking and new behaviors the As-a-Service Economy demands. Let's hope this impending consolidation has this impact and we're having a very different discussion in a few months... let's keep the conversation rolling! I see that the objective is to spark a debate with a provocative idea. This disruption is probably already underway and unlikely to be ten years in the baking, nobody should be surprised to see more firms announcing sequential quarter on quarter declines. I think we are already quite close to the inflexion point (2015..no later than 2016), before it becomes completely unpredictable for a while and then a trend emerges. (Look at also the quarter results of Indian service providers and the shaky foundation of their growth forecast, the proliferation of new providers (as-a-service) spaces, the growth in insourced captives, the changing buyer behavior across, the mad fight to win more commoditized lower end services to shore up the legacy business, notwithstanding that it fuels further turmoil... this is like a script, eventually visible in the performance financials and where they are headed). The obvious core principle at work is that large firms are excellent in applying repeatable principles and scaling - that works just the opposite when things shake - after a critical point it becomes exponential. After a period of randomness some trends will emerge. That's when (most) firms will make strategic moves (M&As?). A crise económica e financeira mundial que se aproxima, provocará maiores danos do que qualquer outra já acontecuda. Your insights are spot on. Your advice might be 180 degrees off. TCS should buy IBM, or at least bits of it. Phil - we saw the shift occurring about 4 years ago when IBM, H-P, and Cisco were on a panel at the Gartner Symposium in Orlando. IBM was questioned about their apparent exit from the infrastructure support services market in North America. They politely said that they could no longer sign contracts in this area due to the increasing competitiveness and margin erosion vis a vis 'as-a-Service' penetration and their high SG&A costs. This was echoed by H-P. Even though their financials are a bit shaky, the Indian heritage players have or are investing in tools and automation systems to solve their fundamental challenge - how to reach the last mile to the customer for services that necessitate local hands and feet. By delivering automation solutions that increase their penetration and resolution rates to 85-90%, they can continue to grow while shifting their own solution sets to the new success models. This is one of your best qualities, the ability to probe, confront and speak your mind with alternate ideas. Thanks as usual for the inspiration. And TCS buying IBM, now that's a shake up. 2) Pressure from Wall St on the service providers. There's no bigger incentive for service providers to change their models than when Wall St investors demand action. Continual quarterly declines / flat performances are beginning to force the issue... this is what will drive more M&A. I think the type of M&A will dictate the pace of impact on the clients - if the right providers and the right tech firms come together, the As-a-Service model will become much more commonplace faster than we expect. 3. The emergence of niche As-a-Service providers. New-generation As-a-Service providers are coming into play with delivery models where cloud and RPA are native to their delivery, such as OneSource Virtual, Aason, Meteorix, Appirio, Ataraxis, CloudSherpas and so on. These firms are operating at a completely different cost-model from the traditional service providers, with more fungible, virtualized, consultative support - and much more focus on post-implementation delivery. Too many of today's providers still obsess with the huge dollars they can make off a solution implementation and less the ongoing delivery and organizational redesign further down the road. This new breed is going to force the model change, and I am sure some of the big guys like IBM, Infosys and co will start buying up some of these niche As-a-Service providers in the near-to-medium term, and potentially ring fence their P&Ls away from the mothership to develop the new model concept. Not too dissimilar from how Oracle nurtured the growth and development of NetSuite, in order to ensure it had insurance down the road of being prepared for the forces of disruptive change. While the article has been written to provoke, the central point that the IT services industry is ripe for a shake out is true. 1) All industries are technology industries. Who you sell to will determine what you can sell. India heritage is almost all at CIO level. 2) Digital will allow unbundling of platforms. From distribution to intelligent data exchanges. Every organization is going to be a networked organization. Labour provisioning is going to become passé. Platform delivery is going to be expected. Don't see other than iBM and Infy who is looking in that direction. 4) Web will become the new old mainframe. The architectures that it spawned will be commoditised. Some IT service providera will try and occupy this space and they should. This is annuity. 5) There are budgets that will get shifted towards change and tackling them will be the challenge. Maybe off all Accenture is best placed if it can execute it right. IBM is trying a big game. And kudos to them for trying. Everyone else seems to be floundering though Infy seems to have a cohesive strategy now. An IBM or a TCS might acquisition is interesting to start a debate but things should get interesting when Huwaei or another Chinese IT company acquires and Indian tier 1 to spread into western market. There is one hope that I do hold (rather naively) in this age of disruptive innovation Wall Street which is getting largely cut off from the start up funding cycle will let incumbent firms invest for the long term. and let them survive the bad quarters they are invariably going to have for several quarters to come. Phil, Thanks much for highlighting the ones that accelerate the pace of change most, of-course wall street and investor forces too, most definitely. Well articulated here !! So, if we go by the general industry stages of any model - from early stages (growth and scale), to maturity (slower growth), to stagnation - disruption (buyouts, consolidations/M&As), rejuvenation - emergence of new model, fresh cycle starts, we are definitely headed to the possibilities of bigger events ahead in the IT services/outsourcing world, I agree. The question is in a sense about timing of these events/the duration of transformation - the shiftover - the landscape that emerges thereafter and so on. I think it's probably a much longer journey for the losers in this process than for the ones that are leading the charge to the as-a-service strategy (IBM - historically they have made such shifts and have continued the journey notwithstanding those poor quarters, Accenture is another one that you would think will make it across). Then, there are folks like CSC, Unisys, others maybe that are still trapped in the consequences of the last disruption of over a decade ago...for them its a decade plus already and they are still grappling with issues of a model that was already eclipsed. The Indian firms are somewhere in the middle and with a slightly negative bias...don't be charmed by those magic quadrants and rankings etc. So here's the thing that I keep debating, does it appear that in these periods of crossing over - a strategy of keep your feet on both sides really work? (And) Does it help to optimize and improve a legacy services model that in the words of a senior executive on a recent earnings call ...is dying? If so, then bringing these two together in a merger is actually a good concept to look at closely(There are of-course other decelerators to this as you noted very correctly). Lets also look at all this from corporate strategy/tactics standpoint, so that we have a dual lens of competitive strategy and marketplace street dynamics sharpening the options for the players in the mix. After all, this is very much about the firms in the picture jockeying for position and improving the odds of future success. Take the point about the struggling mother-ship and developing the new model externally, well you are correct there - IBM has been making small acquisitions for a few years now (across the range of cloud/as-a-service and SMA) and more recently its been CTS, Infosys I suppose...now this is insurance of-course but I guess its double edged. Once armed with the right niche small buys (and goaded by the street) you could say perhaps an Infosys is better prepared to go then pick a more sizeable target that complements in parts and consolidates too and continue the journey, almost equally, you could say perhaps such niche footprints help make Infosys a slightly more attractive target for a bigger player that may see value in buying them. So Infosys acquires a B$+ firm in 2016, then sets itself to make a play for a merged entity that goes for the 20B goal in five years or alternatively is unable to acquire and in the process becomes a potential sale itself? Phil, excellent, thought provoking blog. The comments add to the weight of the blog itself and the this itself proof that your blog is on target. My views are big mergers destroy value. Many small start ups incrementally dusrupting the industry is more likely to happen and then scaled up through acquisition by big players. I also like one of the comments where the writer says every industry is a IT industry and should move to as a service model. I would like advisors like you to drive buyers to look to outsource more and demand more as a service model from suppliers. Having been a keen observer of the industry and having had an opportunity to work with the leadership team at both TCS and IBM through my stints there across a decade, I would say that this question may look theoretical but then you never know! These two organizations differ right from their DNA and their position in trajectory of their growth (or lack of it in case of IBM) currently but then this question merits a discussion. While there will be tremendous value for the clients through a slideware analysis, the challenges of integration would be absolutely unique. At the core, corporate culture aside, I see the difference in the way the leadership at these two companies looks at the services business and managing growth. Their cost structures are also very different and IBM has significantly higher overheads in day to day operations from the view I had across businesses and regions (I would be keen to see how they stack on their Admin and Overhead Costs per revenue dollar data). TCS does not still enjoy the reach and access to US and European markets/clients as good as IBM does. While TCS's senior relationship executives have improved their golf, in many cases they are just not on the right golf courses where the CIOs they want to court play. IBM would gain a lot if the final entity can morph around the way TCS has enabled its offshore delivery framework. While IBM has had presence in India for a while (post their hiatus after the unceremonious exit in 1977 for political reasons), the way the delivery shops work at IBM and the core driving elements are totally different. TCS still has the leadership brain sitting at offshore (India) despite their accomplishments in growing in recent years. As a fact nugget, IBM was in India for several years in India through the Tata group with their TISL JV. So, all in all a great way to let your imagination look at possibilities and reflect that in this business you can never tell what happens next. In many ways, HP is similar to IBM in terms of its revenue decline in services. So, this begs the question if IBM should purchase TCS, whom should HP purchase? The H-P question may be easier than the IBM one - Tech Mahindra. 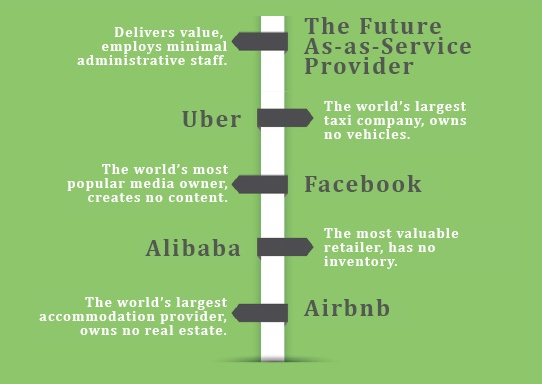 As someone who has spent a long time in big firms, I suspect that In the current org models of the global services industry, the as-a-service model will gasp for oxygen like a premature baby with severe neo-natal struggles. The issue IMHO is simply the misalignment between the revenue models and the incentive comp structures. It's economics 101. Managers are measured by volume - volume of revenue, # of warm bodies they manage and so on. Any model that implies extreme automation, lower revenues, low ticket sizes, and small (albeit very smart) teams enabled by cutting edge tech, simply does not sit well in the current structure. As-a-service calls for a fundamentally different org model which is very hard to stand up when you have steady annuity business rolling in with the current model and there's no crisis in sight. So the can gets kicked down the road. Good call on CapGemini -IGate. Hail Mary.